Everyone likes to eat different chicken dishes especially the children. 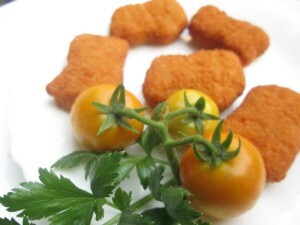 Here is a simple and perfect homemade cheese chicken nuggets recipe and it makes the children happy. This can be used as a tea time snack or nalumani palaharam. Cheese chicken nuggets can be served as a special chicken item and can surprise the friends, family members or other loved ones for a get together parties or function. This snack item is little spicy and at the same time it is very tasty. Try this special snack at home and enjoy! Clean and wash the chicken pieces. Then mince the chicken. In a large mixing bowl, add minced chicken, green chilly, onion, garlic, carrots, celery, pepper powder, salt, maggi seasoning cube, cheese crumbles and mix well. Keep this mixture inside the fridge for 1 hour. Apply some flour in your hands and shape the chicken mixture into regtangular shape. Take three bowls, add 1 cup of flour in one bowl, beaten eggs in another bowl and cornflakes in one bowl. Coat nuggets first in flour, then in egg, and finally in cornflakes. Heat oil in a pan. Deep fry the nuggets. Tasty Cheese Chicken Nuggets is ready.